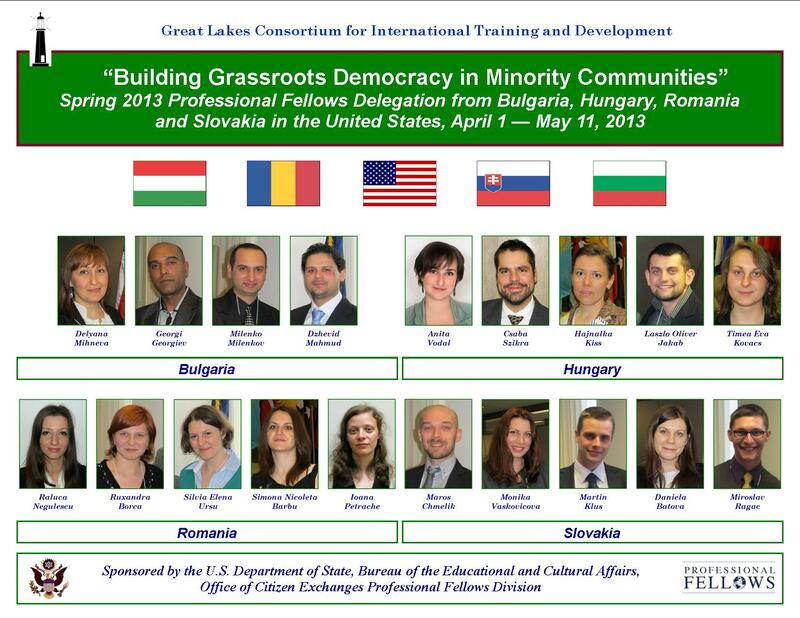 The first delegation with a total of 19 fellows from Bulgaria, Hungary, Romania and Slovakia visit the U.S. from April 1 – May 11, 2013 to participate in group seminars, round-table discussions, site visits, and will have interactions with United States leaders. A tailored 3-week internship with mentoring, multicultural events, and participation in volunteer activities as well as in the Professional Fellows Congress in Washington, D.C. will be also included in the 6-week professional fellows program. Participants will prepare a 6-9 month individual and group Action Plan for follow on activities. They have various opportunities to experience the American family life and the diversity in the U.S. through staying with American host families during their internship in Little Rock (Arkansas), Chicago (Illinois), Boston (Massachusetts), St. Louis (Missouri), Manchester (New Hampshire), Raleigh (North Carolina), Philadelphia (Pennsylvania), Charlottesville (Virginia), Seattle (Washington). A second European delegation is expected in the U.S. from September 30 – November 9, 2013. The Out-Bound component will include at least two American mentors’ teams to travel to Europe (between June 2013 and March 2014) for up to 21 days to provide joint workshops with the alumni and on-site consultation and fieldwork, and conduct wider outreach programs. U.S. and foreign participants will be involved in alumni activities through an alumni social network in each country. We will also establish an online network for continued learning. This program is a collaboration between GLC and its overseas partners: CEGA in Bulgaria, Civil College Foundation in Hungary, CeRe in Romania and Center for Community Organizing in Slovakia as well as the European Community Organizing Network (ECON) and many U.S. partner organizations involved in the joint program and the tailored internship, and follow up mentoring activities. Building Grassroots Democracy in Minority Communities is a project of Great Lakes Consortium – through WSOS Community Action Commission, Inc. – as Contract Agent and Manager – granted for a two-way exchange between September 2012 and August 2014 from the U.S.